He ends by considering the role that sugar is playing in the global obesity/T2 diabetes crisis that is currently engulfing the world and whether human beings’ craving for sweetness can ever be constrained. He talks about the sugar taxes that have been tried around the world and their varying level of effectiveness. We are about to begin our own experiment in the UK with the so called “soft drinks levy” on sugary drinks. He marvels that Coca-cola is now proudly advertising itself for what it DOESN’T contain – sugar – than what it DOES contain (not much that you would want to put inside you in my view). However this morning I think I encountered true madness in a free handout at my train station this morning… sugar free Lucozade. My 150ml freebie can says it contains a feeble 6 kilocalories. Lucozade is a soft drink marketed as a range of sports and energy drinks. Created in 1927 as “Glucozade” by a Newcastle pharmacist, William Owen, as an energy source for the sick, it was renamed Lucozade in 1929 and acquired by Beecham’s in 1938. Hospital visitors in the UK would regularly arrive with a bottle of Lucozade. The product is a glucose–water solution; as of 2016 a 500 ml bottle contained 62 grams (15.5 cubes) of sugar, more than Coca-Cola. Beecham, known since 2000 as GlaxoSmithKline, rebranded it as a sports drink in 1983 to associate it with health rather than sickness, switched to a plastic bottle, and introduced a range of flavours. So there you have it, the UK sugar tax’s first triumph, the creation of an almost completely energy free, energy drink!! I won’t be drinking my free sample. So there you have it. Corruption, illness, madness, addiction and (if you are a man) depression. One lump or two? You can actually feel this doing you good as you eat it! 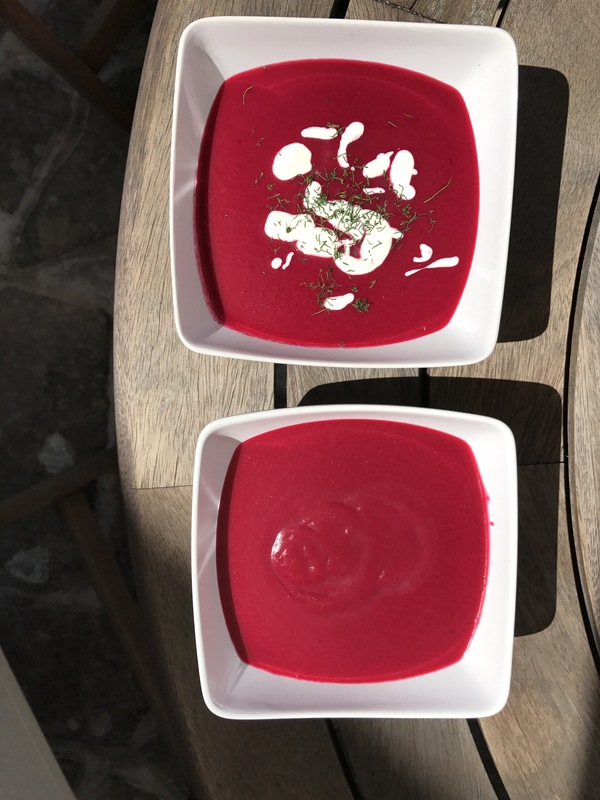 Chilled beetroot soup with soured cream and garnished with fresh dill on a summer’s day. For six generous servings you need about 1.5 pints of good chicken stock (bone broth), one medium red onion, 3 large-ish cooked and peeled beetroots, a couple of bay leafs, soured cream and fresh dill. I take the fat from the top of the stock (the layer of fat has sealed the stock and kept it fresh) and fry off the finely diced onion. If you have had to buy the stock you can fry off the onion in lard or butter. As the onion frys roughly dice the cooked and peeled beetroot. I roasted my beetroot the day before for about and hour wrapped in foil and just put the in the fridge still wrapped in the foil. The skin just falls off when you peel them. When the onion is soft – don’t let it brown – add the stock, chopped beetroot and bay leaf and boil for 5-10 minutes. Fish the bay leafs out (don’t forget to do this!!) and blitz the soup until smooth. To get it really smooth I then push the soup through a fine mesh metal seive with the back of a spoon and discard the fibrous bits that won’t go through. Take your soup to the fridge and chill until really cold. Serve garnished with soured cream and chopped fresh dill. Delicious. Summer in a soup bowl. You’re welcome! As Re-Find Health are frequently reminding me, the journalist and author of among other things The Case Against Sugar , Gary Taubes will be in London in November speaking at a seminar held over two days. Should be interesting! One question my clients frequently ask me about cutting out refined carbohydrates is whether it is possible to just have a bit… the odd piece of toast, a croissant, maybe some jam? To which the answer is “Yes, of course it is but once you have weaned yourself off processed carbohydrates you’ll pay for it if you eat them. Symptoms may include nausea, diarrhoea, bloating, headaches, water retention and unexpected and sudden spikes in your weight. Still want a slice of toast?” To which the answer is frequently “Yes I do.” And they eat what it is they crave and all my dire predictions as to what will happen to them come true. They then have a miserable few days feeling awful while they repair the damage and wean themselves off the carbs again. Why put yourself through such self-inflicted torture? Here’s an interesting article from the New York Times written by Gary Taubes where he suggests that carbohydrates may actually be addictive and sugar particularly so. He suggests that for most carbs it may be the insulin response that causes the addiction as insulin both stops fat burning and clears sugar from the blood stream, removing the body’s two main sources of energy and causing the desire to eat more carbs. I think it goes a bit deeper than that in the case of wheat. I think there is enough evidence out there that suggest that the gliadin protein in modern wheat acts on the brain in the same way as opiate drugs (such as heroin) do. Supermarkets exploit this by taking the vapour from the in store “bakery” and injecting it into the ventilation system so that you can smell the bread all over the store. It’s particularly noticeable at Easter when the whole shop smells of hot cross buns. The shop is simply reminding you that you are addicted. So when my clients come to me complaining of feeling ill after eating bread after they have tried so hard to come off it, I don’t criticise, I sympathise. They have a real addiction that is terribly hard to conquer.